Young participants in the America’s Cup community sailing initiative, Endeavour, will learn to harness the power of wind wherever they are with the addition of Blokart International ltd. as an Official Supplier. 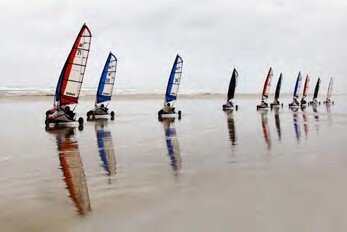 The high performance wheeled land sailing karts will be used for training and racing. Endeavour is a youth-focused community sailing and educational program in connection with the 35th America’s Cup, with a mission of providing unique sporting and educational opportunities through sailing for youths across all socioeconomic backgrounds. Participants will begin using Blokart equipment later this year, and will also take part in a Blokart race during the 35th America’s Cup. “At Blokart we’re passionate about introducing people to the thrills of sailing,” said Paul Beckett of Blokart International. “We may sail on land, but our whole philosophy is about sharing the joy and excitement of using the wind to satisfy the need for speed. Although the scale is completely different between Blokarts and America’s Cup boats, the angles you can sail and the speeds you can reach are very similar. We hope every participant has the time of their lives.” For more information, visit blokartusa.com.